Cambodia's latest social media sensation is a five-month-old calf believed by a villager to be the reincarnation of her dead husband. 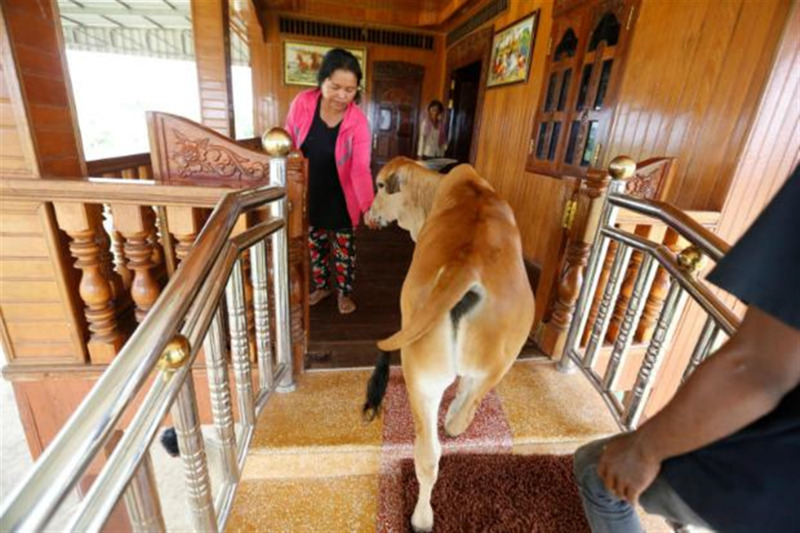 A cow walks into a house of a family that believes it's their reborn patriarch in Kratie province, Cambodia, on Tuesday. Cambodia's latest social media sensation is a five-month-old calf believed by a villager to be the reincarnation of her dead husband. Khim Hang, 74, said up to 100 people a day visit her home in northeast Kratie province to see the calf she said behaves very similar to her husband, Tol Khut, who died more than a year ago. "I believe that the calf is my husband because whatever he does...is in exactly the same way as my husband did when he was alive," she told Reuters Television. The young cow was born in March and has attracted a strong following on social media. "I thought it was quite unusual to see a cow go up to the house like this," said Thach Vin, 32, referring to a video she saw on Facebook in which the calf walked up stairs into the family's one-storey home. "So I came here to see it with my own eyes," she said. Once inside the wooden house, the calf is fed, washed and put to bed with a fluffy pillow once used by Tol Khut. Cambodia is 95 percent Buddhist and many believe the soul of a person is reincarnated after death. "I will keep him and take care of him for my entire life," said Khim Hang.